On May 2 2007 St Lucia Distillers was struck by a major fire. Mercifully most of the distillery was spared but there were great problems with storage, forcing them to find space for ageing casks in the most unusual places. 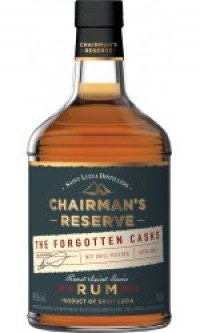 Having done so, the cellar team had a memory lapse and forgot the casks that had been laid down for award-winning Chairman's reserve. These casks were found recently and upon tasting were found to contain a wonderfully complex rum which has now been offered as a limited release: Chairman's Reserve - The Forgotten Casks, which has already won a gold medal and best in class at the International Wine and Spirit Competition 2011.